Cell biologist and Dr. R. Malcolm Brown, Jr. was the first professor at the University of Texas to work on a personal computer. "They told me I had to use the mainframe," Malcolm recalled to me over a meatloaf and catfish lunch yesterday at the Eastside Cafe in Austin. "But I said 'no,' I'm gonna go ahead with this." I could tell the excitement he felt 30 years ago from the way he told the story. "You'd be amazed what you could do with 48K in those days!" Even though he was a trailblazer in putting the PC to academic use, Prof. Brown has made a career out of playing with plants. His greenhouse and garden in the hills west of the Texas state capital are immaculately arranged, and at his namesake laboratory back on the UT campus, some beakers hold algae cultures that have been growing for 40 years. Just as over time the rest of the world woke up to the possibilities of computing and connectivity, today the tiny organisms that Malcolm Brown and dozens of his graduate students have nurtured and examined for over a generation are recognized as potential biofuel powerhouses. Dr. Brown got in touch with me early this year after reading my dispatch from the American Council on Renewable Energy's RETECH expo. I noted that Brazil's largest sugar processor Cosan (NYSE: CZZ) had entered into a $12 billion joint venture with Royal Dutch Shell (NYSE: RDS), Europe's second largest oil producer. As I've stated a few times now, there are several pivot points between fossil fuels and renewables. Maybe it's an offshore oil rig being powered by wind turbines, or in the case of Dr. Brown's research, oil fields in west Texas where waste water is host to a cornucopia of productive organisms. New federal rules and incentives are making collaborations between oil titans like Shell and biofuel powerhouses like Cosan commonplace. The next step is bringing cellulosic ethanol to billion-dollar scale. On February 3, the Obama Administration released its Final Renewable Fuel Standard, known as RFS2. Under RFS2, corn ethanol's status will diminish over the next decade because of its weakness relative to sugarcane ethanol. This is a point of heavy contention from corn state lobbyists and corn ethanol enthusiasts across the board. From farmers to ADM crop scientists, many assert rightly that corn ethanol research and development should continue. I invite feedback from anyone involved in the sector. However, the chain from research to policy to profit right now runs straight through what are known as advanced biofuels. Advanced biofuels have a greenhouse gas (GHG) footprint that is over 50% better than gasoline. Land use factors in heavily to the Environmental Protection Agency's GHG calculation, and RFS2 follows EPA stats showing that sugarcane ethanol has an International Land Use Change (ILUC) impact less than 1/6 that of corn-based fuel. There's a step above sugarcane feedstock, however, and it's cellulosic ethanol. This is where Dr. Brown and his beakers come into play. If you think of cellulosic ethanol currently, corn husks and switchgrass may come to mind. Yet, this week I've seen time-lapse footage taken through a light microscope in Malcolm Brown's lab that shows a bug called acetobacter spinning out cellulose like a spider spins a web. The strands produced by these micron-sized bacteria are nanometers wide, which means that when put together, a sheet of cellulose produced under optimal conditions can be as strong as steel. It can also be used to make paper, of course, since it's analogous to wood pulp. There are other mighty bugs in Brown's lab, too. EPA calculations put cellulosic ethanol GHG emissions at 60% less than gasoline, but that includes land use just like corn ethanol. Being a Texan, Malcolm Brown has grown cultures in water from all over the state; he's found that some of the best water for growing bugs that produce sugar and cellulose is found in oil wells where brackish water is a waste product of crude extraction. Even enhanced oil recovery (EOR) techniques now in use to get more oil out of dying fields can lead to bountiful bacterial produce, because the carbon dioxide from that process can be used to stimulate increased sugar production during photosynthesis. Prof. Brown also showed me in his lab how cyanobacteria, commonly known as blue-green algae, can be shocked into producing more sugar than normal by changing the salinity of the water they're in. It's basic osmosis—the kind of stuff you learn in high school biology class—but seeing it applied to create next-generation biofuels is pretty amazing. Now, as with every single renewable energy type we talk about in Green Chip Review, it's a matter of scale. 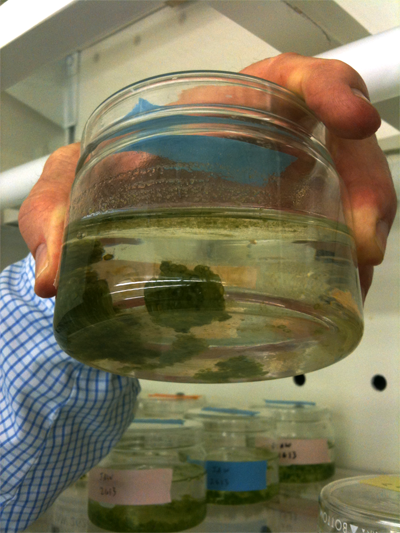 These cyanobacteria have been tested in ponds and can be scaled up to testing in square-mile size tracts of foot-deep water. They can be placed next to power plants to take carbon dioxide into the fuel production process, or large tracts of scrubby west Texas land can be laid across with oil well water to grow the bugs. Jose Goldemberg, the Brazilian scientist who set off that country's biofuel revolution in the 1970s, has met with Malcolm Brown and marveled at the production he's been able to get out of such simple organisms. In test tanks and ponds, the UT-Austin team has logged 14 tons of sugar per acre-foot per year. In laboratory conditions, that harvest rises to 94 tons of the sweet stuff, which is equivalent to 13,000 gallons of ethanol per acre-foot per year. That sucrose can then be added directly to yeast to create ethanol, instead of breaking down cellulose starch to get glucose. The best part is that while these scummy powerhouses work, the sugar they put out can be taken without blasting the cells apart — this may be the ultimate renewable fuel. You can learn more about Dr. Brown's work and goals here at his laboratory's website. He'd be happy to hear from you, and I can tell you that his enthusiasm for creating a high-efficiency, world-leading biofuel in the United States is contagious. Just as Jose Goldemberg's vision in 1978 was turned into a national initiative to make Brazil a world energy power and investment target, researchers across the U.S. are working to make American biofuels maximally efficient and, ultimately, very profitable for investors who follow the idea flow from lab to market. As Nick Hodge reported last summer, Exxon Mobil has already made a $600 million bet on algae biofuel. Surely that's not the end of the money movement into this sector. What are you up to? We like hearing from the Green Chip community about the ideas that are driving investment. Contact us any time through www.greenchipstocks.com. Editor Sam Hopkins writes from D.C. today, where he's attending the American Council on Renewable Energy's RETECH expo, and mining the showcases and speakers for new stock picks.